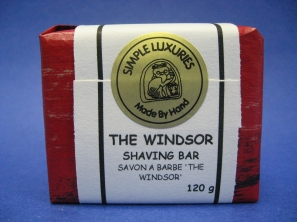 This special bar combines cinnamon oil, which makes the hairs stand up for easier shaving, with other spices and herbal oils to create a scent that is exceptionally manly. Its rich, dense, moisturizing lather comes from castor, coconut, olive, jojoba and sweet almond oils. Wholesome milk is added for its mild creaminess and its value in maintaining the skins pH balance. The cold soap making process also gives it loads of glycerine that protects skin from drying.